It's time for an adventure! Join Peppa Pig, George, and Peppa's school friends as Daddy Pig takes them on a very exciting camping trip to the woods! With songs, dancing, games and plenty of fun, Peppa and the gang star in a musical extravaganza that's guaranteed to make your little one smile! 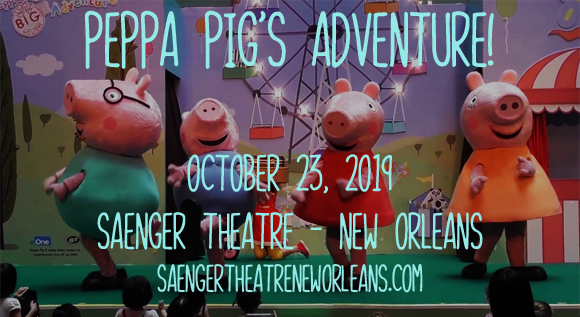 Pepps Pig's Adventure comes to Saenger Theatre – New Orleans on Wednesday 23rd October 2019! Peppa Pig's Adventure is a new, interactive musical show that's perfect for the whole family! Bringing all the magic of the beloved children's program to the stage, this colorful and energetic experience joins Peppa, George, Daddy Pig, Pedro Pony, Suzy Sheep and Gerald Giraffe as they set out in the bus to explore! With catchy songs and a deligthful story, this show is bound to warm your heart!